Once upon a time, politicians across the land found a magical formula for achieving popularity. They kept public employees’ pay low, enabling low tax rates (hooray! ); to make up for the low pay, they promised fat pensions down the road (huzzah!). The pensions were funded by gimmicks and wishful thinking. But that would be a problem for future politicians to reckon with. 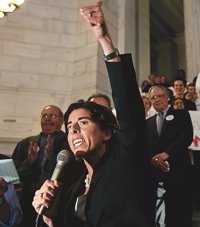 Raimondo is one of the first to perform that necessary reckoning. Last year she led an unprecedented reform, raising the retirement age (to 67), freezing cost-of-living increases, and adding a 401(k)-like plan to the traditional (shrunken) defined-benefits plan. Raimondo, a Democrat, says she ran for office largely to perform this thankless task. The state’s pension payments were crowding out spending on things like libraries and public buses—services she depended on in her youth. Amid the pain and the blame, Raimondo focused on the math, recognizing two things: That waiting longer would mean harsher adjustments for all, including the public workers themselves. And that the state has a duty not only to the past, but to the future as well.